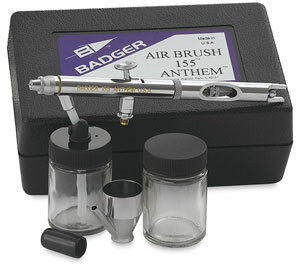 Badger's Model 155 "Anthem" Double Action Airbrush is the most versatile, comfortable, reliable, and proficient airbrush Badger has ever made. With Badger's Model 155, there is no need for separate tips to spray different materials and consistencies. Anthem's thinner diameter needle meets with the cone-shaped paint tip in a manner that enables a single needle to spray virtually any desired material, thus eliminating the need for fine, medium, and large needle/tip assemblies. Anthem's streamlined body design provides exacting balance and long-term user comfort. Needle removal and replacement is extremely fast and easy. In all, Anthem offers excellent performance in the most rigorous production circumstances, yet is easy for the novice to operate. Model 155 "Anthem" Set — Includes the airbrush, a ¼ oz color cup, a jar adapter, two 2 oz jars, a ¾ oz jar, a 6 ft (180 cm) braided air hose, and an instruction booklet.